Is Westminster ready for the Jeremy Corbyn Effect? The Jeremy Corbyn effect is happening all around the country. This candidate for the Labour Leadership is being welcomed around the country. MPs do not seem to be in touch with the ordinary people. Why has it been so difficult for anyone challenging the austerity, neoliberal agenda which Thatcher and Reagan initiated, and which has been inflicted on people ever since to achieve a nomination to lead the Labour Party? It is not as if the nation has no appetite for the Jeremy Corbyn Effect. Is it that the path to an MP is expensive and out of reach for ordinary people? Is it because of the antisocial hours and that it is based in London, too far and expensive for ordinary people to travel to? Is it because the selection process has presented an unrepresentative Oxbridge majority which people cannot identify with? Is it because the privately funded Progress has used its resources from lobbyists to give their Blairite candidates a shortcut route to Westminster? Our parliament is not a career option. MPs are elected to serve the people in the interests of the people, and that seems to have been forgotten. Dennis Skinner knows this, and it is because he attends parliament every day, works tirelessly for the working class that he is respected and admired by people of all political persuasions. Recently elected new Labour MPs are now questioning the status quo. Richard Burgon, Clive Lewis and many other new MPs oppose austerity. Jess Phillips’ maiden speech for women’s equality was passionate and spoke for many ordinary women. Her claim that Nicky Morgan’s lack of support is a “disgrace” was welcomed as the privileged Morgan went through the “No” lobby. SNP’s Mhairi Black’s maiden speech went viral, a 20 year old woman speaking confidently and challenging the Establishment. What is left-wing? The term is used by the press to scare people into believing a horror scenario, that Britain is being transformed into some kind of totalitarian state. What is the truth about this current government if it is not extreme? Let us be clear; Jeremy Corbyn’s politics are not extreme. 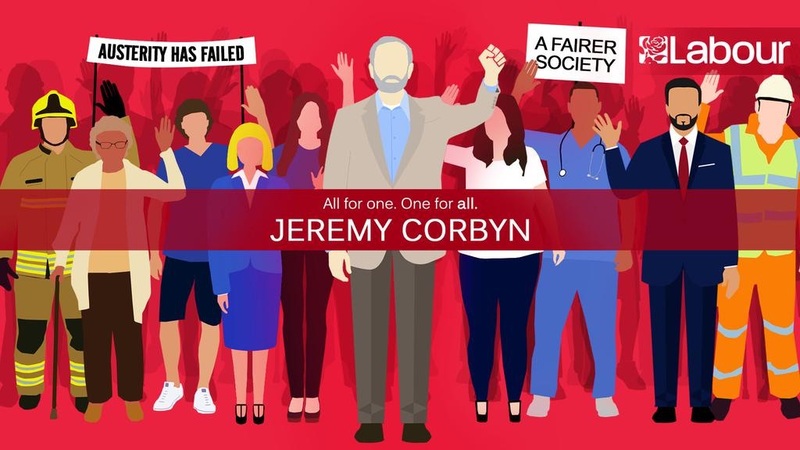 He is a democratic socialist, with an increasing majority and has represented his constituents in North Islington since 1983 – thirty two years of electability. He claims the lowest expenses of any other politician. He is not in politics for a career, it is because he believes in equality, fairness and justice. He stresses that it is not about one person – but about building a team, working together with people in parliament and around the country, listening to their problems and their needs, and finding a way to help one another. But of course, the Tory press will say he is a communist extremist. They will cite the 80s socialist Michael Foot, who in 1982 was well placed for election in 1983, and would have been but for the Falklands war and the SDP/Liberal Alliance hatched 10 days before an election, as discussed in “Opening Pandora’s Box“. Take time to read that excellent manifesto, and consider what the world would have been like had Thatcher not been re-elected, leading to mass privatisation, unemployment and manufacturing decline. In fact, there is a great similarity with the Labour’s leader in 1945, Attlee, whose government achieved a great deal for working people, and hope for many. The opportunities for those born in the 50s and 60s were an NHS, comprehensive schools, full employment and university grants. Other generations deserve those same chances in life, but the Tory government is destroying hope. Expose the myth of Labour overspending – address the truth that greedy, privatised unregulated banks and a sub-prime mortgage crisis in the US led to a tsunami of economic problems all around the world. Make economy work for people, money is just a tool for distribution of assets. Unfortunately, privatised banks have been creating virtual money at will – the forever-in-debt scenario where ordinary people can never escape from, because the very nature of such an economy is to keep power with the rich. Democratise the money system, and ensure Modern Monetary Theory (MMT) is adopted which can be controlled to invest in people, building homes, schools, hospitals, and investing in green, and technological industry. Bring back full employment for everyone who can work. Ensure we retain a safety net of security for all of us, when crisis hits our lives , whether in health, or old age, not private insurance companies who gamble with our lives. Let’s call it social security or protection, not benefits, because that is what welfare was intended for, for all of us. If we can overcome the fear, open up politics and parliament for the millions who have not voted, then, I believe that Westminster is ready for the Jeremy Corbyn Effect. He is just the beginning. For Team Labour it is a rebirth of a Labour movement, and in that we should rejoice. There is no right, no left – our watchword is Unity, and Forward.